By Srinivas Chowdary Sunkara // petrobazaar // 15th Oct, 2018. Fuel oil prices in the Singapore markets are improved slightly today. Both 180 cSt and 380 cSt graded fuel oil futures are edged up by $3.5 or 0.65% from earlier closing price. MGO prices are slipped by $5. Asia's fuel oil markets closed steady on Friday but posted weekly loss of $16. 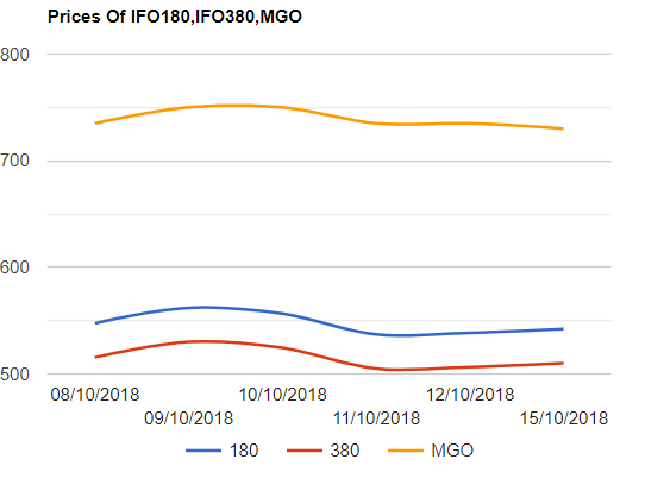 The last week's Fuel oil price trend reflected on expected improvement in near term supply outlook due to higher Western arbitrage supplies in November as per the trade sources as mentioned in FIS commentary. In India, Fuel oil prices are set to rise for the first fort night across all the depos as the local currency is depreciated along with the abnormal increase in the fuel oil prices in the international markets since the beginning of the month. Good day.